The Paradisus Playa del Carmen La Esmeralda has announced plans for a new water park. The water park — free to all guests of the luxury all-inclusive resort — will feature five waterslides, and is expected to be complete before the holidays. A Family Vacation Critic Favorite Hotel, Paradisus Playa del Carmen La Esmeralda features the Family Concierge, a guestroom category and resort area of its own. 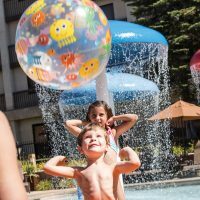 Guests of Family Concierge rooms enjoy a separate check-in area and special perks just for kids. Paradisus will soon open another all-inclusive resort with a water park and kids’ club in Punta Cana; the Grand Reserve at Paradisus Palma Real is expected to open later this year.